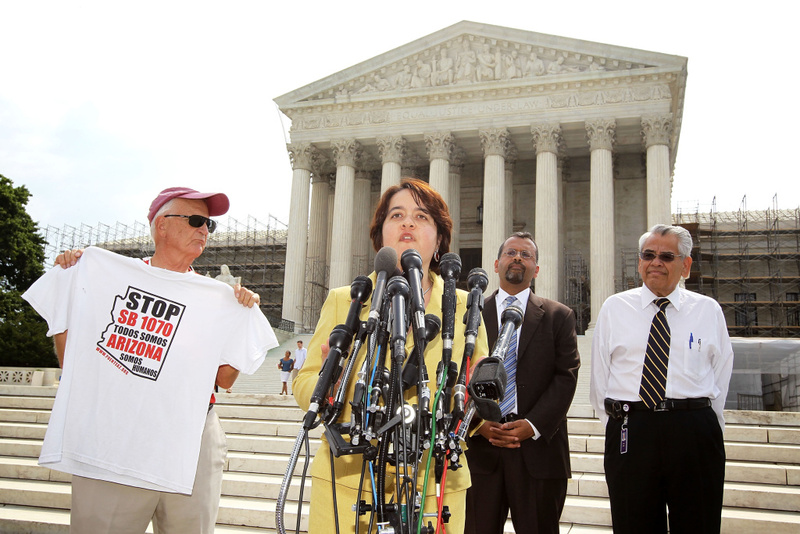 Marielena Hincapié, executive director of the National Immigration Law Center, speaks as Deepak Bhargava (2nd R), Executive Director of the Center for Community Change, and Eliseo Medina (R), International Secretary-Treasurer of Service Employees International Union, listen in front of the U.S. Supreme Court June 25, 2012 in Washington, DC. The Supreme Court has struck down three parts of the Arizona anti-illegal immigration law, but upheld the controversial "show me your papers" provision. The Supreme Court gave Arizona and President Obama a split decision today, striking down most parts of the State's SB 1070 Illegal Immigration law, but keeping the key “show me your papers” provision that allows law enforcement to ask for immigration documents. But Officers can't single out just anyone. They have to have ‘’reasonable suspicion’’ of some kind of offense – and then they can inquire about immigration status. This of course leaves a large gray area for individual counties to determine how they’ll enforce the law. The sheriff of Pima County, Arizona’s second most populous, explains how the ruling will affect his deputies – and how it won’t. And does today’s ruling still leave room for potential racial and ethnic profiling? Is the Roberts court the most partisan Supreme Court in history?